1. Arboe: East face of Cross. Detail of Shaft. Sandstone Cross. Situated in west of Churchyard, in Arboe, west of Lough Neagh. The Cross is carved from 4 blocks of red sandstone. It measures 5.7 m high, and 1.07 m at the arms. The shaft is 58 cm wide and 36 cm thick. The base has two steps. East face. Shaft. E1 Adam and Eve knowing their nakedness. Old Testament. Book of Genesis. E2 The sacrifice of Isaac. Old Testament. Book of Genesis 22.7. E4 The 3 children in the fiery furnace. Old Testament. Book of Daniel. E5 Projecting rectangular panel with fret pattern and spiral bosses. E6 The Second Coming of Christ - flanked on both sides by the bust of an angel. New Testament. Book of Revelation. The Last Judgement. New Testament. Book of Revelation. S1 Cain slays Abel. 2 figures Abel standing. Old Testament. Book of Genesis. S2 David slays the lion. Type 1 David on lion's back. Old Testament. 1 Samuel 17.34. S3 David meets/kills Goliath. Old Testament. 1 Samuel 17.49. S4 Saints Paul and Anthony breaking bread. Hagiography. End of arm unidentified figure. ?angel. W1 Adoration of Magi. Type 1 Magi around the BVM. New Testament. W2 Marriage feast of Cana. New Testament. W3 Multiplication of the loaves and fishes. New Testament. W4 Entry of Christ into Jerusalem. New Testament. W6 Mocking of Christ (Ecce Rex Iudeorum). N1 Baptism of Christ. New Testament. N2 Jesus before the Doctors of the Law. New Testament. N4 The annunciation to the shepherds. Head. N5 and N6. No representational figures. End of cross arm, unidentified figures, very weathered/worn. Cross at Arboe. East Face. Shaft, panel E1 Bottom panel, barely visible on this slide, the two heads of Adam and Eve 'knowing their nakedness' on either side of the tree of knowledge. E3 Daniel in the Lions' Den. Old Testament. Book of Daniel. 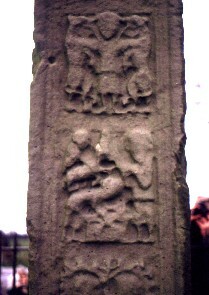 Type C Depiction with 2 vertical lions. Depicted also at (? )Armagh (E4), Killary (E4), Monasterboice Tall Cross (N4), and Oldcourt, E base upper panel. Ancient Monuments of Northern Ireland I. In state care 1, HMSO, Belfast (1962) . Bigger, F. J., Fennell, W. J., , ‘Ardboe, Co. Tyrone: its Cross and Churches’. In Ulster Journal of Archaeology (1897) 4, 1-7. Calvert, J. A., The Early Development of Irish High Crosses and their relationship to Scottish Sculpture in the ninth and tenth centuries , University of California, Berkeley (1978) Ph.D, . Gsanger, H., Irland, Insel des Abel. Die Irischen Hochkreuzen 1, , Freiburg i. Br. (1972) . Whitelock, D. McKitterick, R. Dumville, D., Ireland in Mediaeval Europe. Studies in Memory of Kathleen Hughes 1, , Cambridge (1982) . Historic Monuments of Northern Ireland: an introduction and guide 6, HMSO, Belfast (1983) . Roe, H. M., , ‘The High Crosses of East Tyrone. A Photographic survey with notes on the Monuments’. In Seanchas Ardhmacha (1956) 2, 1, 79-89. Ó Danachair, C., Folk and Farm, Essays in honour of A. T. Lucas 1, , Dublin (1976) . Sexton, E. H. L., A Descriptive and Biblographical List of Irish Figure Sculptures of the Early Christian Period 1, , Portland (1946) .